“Streets of (…) Series” is a way of discovering cities. Can you recognize a city from its apartment doors or boardwalks? In this project I turn fragments from all over the city into one street. The street can be rearranged. It’s interesting to imagine how people in the different photographs will meet – even though they were never close in real life. Time doesn’t exist in a traditional sense. When working with the San Francisco series I soon realized that the boardwalks looked different from the European ones. With the Umeå and Härnösand series it’s hard not to pay attention to the wooden houses. Berlin is different in so many ways. The only thing reoccurring is myself. I’m present in all of them. 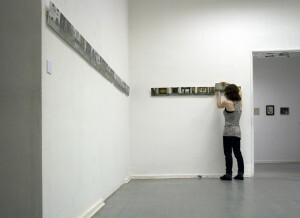 The project was exhibited at Künstlerhaus Bethanien/Kunstraum in Berlin June 2009. Between 13th of February and the 28th of March 2010, the San Francisco and the Härnösand series was exhibited at the Y-salongen in Härnösand/Sweden.